That’s the question asked by the Arizona Republic in this article. Let’s go through their article, shall we? What’s with the media and not including actual pictures of Chris? It’s almost as if they don’t want to reveal the fact that he’s a well-dressed, tie-wearing, bespectacled black man, not some frothing-at-the-mouth nutjob. Of course, the color of one’s skin is irrelevant, but I can’t help but suspect that the media isn’t showing those pictures because it might cause some people to reconsider their worldview. Just as local and state tourism officials tried to shed Phoenix’s unbecoming title as the “kidnapping capital of America,” another national moniker has emerged: gun-crazy. I’m not sure that Phoenix was ever labeled the “kidnapping capital of the world” — maybe in the US, and maybe if you’re involved in the illicit narcotics trade, but certainly not for everyday persons. As for the “gun-crazy” thing, says who? Being a “gun-loving vestige of the Wild West” is a bad thing…why, exactly? The Old West was not nearly as “Wild” as movies make it out to be. The firearms display, later revealed to be a publicity stunt, was legal under an Arizona law that allows most citizens to openly carry guns in public without a permit. ZOMG! People can lawfully carry arms, and some choose to do so openly! While this may come as a shock to some people, particularly urban New Englanders, almost every state in the union allows their citizens to carry arms, mostly concealed. Several states, including Arizona, don’t prohibit the open carriage of arms so long as the gun itself is not concealed (e.g. secured in a holster on the waist). But the spotlight cast by cable-news pundits, newspaper editorials and blogs – including censure from a world-renowned travel writer – raised questions about whether Arizona’s lax gun laws make it safe to travel and do business in the state. I can’t imagine how having law-abiding persons carrying arms makes the state any less safe. While I admit that carrying a rifle to a public event may not be in the best of taste, what’s the big deal? 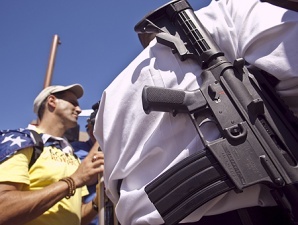 Rifle or pistol, a huge number of Arizonans — many in Phoenix — carry arms on a regular basis. I seriously doubt that Phoenix will lose many conventions or tourism: unless one is an activist or enthusiast of some sort, a state’s gun laws are not likely to enter into one’s thoughts when planning a convention. I’d suspect that location, number of nearby hotels, proximity to an airport, cost, and city life will be much higher priorities for convention planners and goers. See, those are criminals. Chris, and others like him, are law-abiding citizens. Big difference. The most visible [armed protester -AZR] was Phoenix resident Christopher Broughton, who verbally sparred with Obama supporters and gave media interviews with an AR-15 rifle strapped to his back and a pistol holstered at his side. A libertarian radio host, also sporting a pistol, said later that he and others cooked up the media stunt to draw attention to Second Amendment rights and Arizona’s open-carry law. While I’ve said that such a stunt is probably not in the best of taste, what’s the big deal? National news outlets, however, portrayed it as a disturbing trend, given America’s history of presidential assassinations. Obama was inside the convention center, surrounded by a veritable army of Secret Service agents and police, behind a cordon of metal detectors and x-ray machines. I sincerely doubt that anyone meaning the president harm would be able to get within visual range of him. Chris, and the other protesters, were outside, on a public street, with a few cops and a Secret Service agent in the immediate vicinity. “It is hard to know what is more shocking: the sight of a dozen Americans showing up to flaunt guns outside the venue for President Obama’s speech in Phoenix on Monday, or the fact that the swaggering display was completely legal,” the New York Times wrote Aug. 20. How is any of this shocking? Outside of New York, there’s a (mostly) free country. Don’t get me wrong — I’ve visited New York (both the City and the State) several times and enjoyed my visits, but urban New Yorkers tend to be rather insular and unaware of the goings-on in much of the rest of the country. I’d imagine that for someone who was born and raised in a highly-urbanized area where restrictive gun-control has been the norm for several generations, the sight of ordinary citizens with guns could be shocking…but so what? Founder of the Frommer’s series of travel guidebooks, Frommer wrote that he would no longer visit Arizona, fearing for his personal safety after reading accounts of protesters carrying loaded weapons on the streets of Phoenix. Frommer, who sold his company decades ago, was unavailable for comment. But he told NPR last weekend he was disturbed police officers stood around “like scared rabbits” while armed protesters tried to “threaten” and “intimidate” Obama supporters. Fortunately Frommer doesn’t speak for the company that bears his name, so I’ll have no problem purchasing their excellent travel guides. The police were certainly not “scared rabbits” — they were there to ensure the public order. Since the armed protesters previously informed the police that they’d be showing up, so as not to needlessly surprise and alarm the police, and were peaceable and law-abiding at all times, it’s hardly an issue. I’ve seen videos of the event, and I can’t find a single example of armed protesters threatening or intimidating anyone. Anyone care to provide such evidence? “Open-carry laws have to take second place to public order and to life,” said Frommer, a New York Democrat and Obama campaign contributor. The lawful carriage of arms, including doing so openly, can help preserve and defend life. Really? Law-abiding people carrying legal guns in a safe, legal manner is somehow “frightening”? Mayor Gordon has pointed out that Arizona is just one of 11 states where citizens don’t need a license to carry a firearm in public as long as it is visible. In fact, there are only seven states where openly carrying guns is unlawful. In short, the majority of states allow open carry. Hardly a big deal then. Why, then, is this a huge news story? But this year, Republican Gov. Jan Brewer signed into law three major bills that expanded gun rights, a step proponents said makes the state a safer place. Beginning Sept. 30, one of those laws will allow people with a concealed-weapons permit to carry guns into restaurants and bars, though they can’t pack heat while consuming alcohol. Again, a step in the right direction. The law that clarified when it was legal to display firearms in self-defense was a big deal. The number of law-abiding persons carrying arms is increasing, yet crime is dropping? Shocking. According to that link, there was an 18.4% increase in the number of permits issued from 2007 to 2008 and a 16.4% increase from 2006 to 2007. From 2006 to the present, there’s been a 58.9% increase in the number of concealed carry permits issued. Arizona is indeed a safe, beautiful state. I highly encourage people to come visit and explore. If you choose to visit and lawfully openly carry a firearm whilst exploring this great state, more power to you. This evening, a man with an openly-carried gun went to the grocery store with a fellow scientist. While there, he came in close proximity to alcoholic beverages on shelves, yet did not go on a drunken shooting rampage. During his time in the store, he passed by numerous women and children, and encountered a co-worker and his cousin. After placing numerous items of microwaveable food (( I normally eat better, but I’m going up to the telescope this weekend to observe, and they only have a microwave. )) in his cart, he paid for his purchases using a MasterCard and returned home. Sorry for being so quiet as of late. Class has started back up and, in addition to having a rather busy workload, money’s short so I haven’t been shooting that much. When it comes to the blogosphere, I’m more in “receive” mode than “send” as of late. My apologies. AAC is running billboard ads for suppressors. Very cool. Personally, I think the restrictions on suppressors are silly: assassins are not going to bother jumping through all the hoops to get a legal suppressor, as they’re already going to be committing the more serious crime of murder and won’t worry about relatively minor firearms violation. Fortunately, assassins and movie-plot threats are essentially unheard of — I can’t recall a single incident of a criminal using a suppressor in the last few decades. Suppressors have numerous perfectly legitimate purposes: reducing the risk of hearing damage, reducing noise pollution (particularly for ranges located near populated areas), reducing airborne lead, and making for a more pleasing and enjoyable shooting experience. Suppressors are safety devices, and so should be removed from the NFA list and treated just like any other unregulated gun accessory. Sometimes the only way to deal with intimidation is with laughter. LabRat goes into some detail about the difference between the capacity to do harm and the intent to do it. Death Panels Exist In England! See this BBC article for details. A few commenters on sites I’ve read have brought up objections to people carrying guns to public events and mention that cases of people bringing guns to presidential events were rare during the Bush administration. They continue by saying that peaceable protesters against Bush were herded into “free speech zones” and wonder where the outrage was then. I can’t speak for everyone, but from my perspective “free speech” zones are an abomination against the Constitution, and are a dark mark on our nation’s history. Perhaps a relatively small, easily corrected mark (( Unlike, say, major things like slavery. )), but a mark nonetheless. During Bush’s presidency, I regularly wrote polite, concise letters to the president and my congressmen voicing my objection to such zones. Such policies weighed heavily upon me when I went to the ballot box (( I voted third-party in both of his elections. )). Fortunately, President Obama does not seem to be repeating the same mistakes, and this pleases me greatly. I think that “zones” of that type are outrageous — there should no more be “free speech zones” than there should be “no quartering troops here zones”, “Second Amendment zones”, “no slavery zones”, or “privacy zones”. The whole country is such a zone. Of course, there are exceptions: I don’t consider it unreasonable for authorities to remove someone disturbing a public event. For example, if someone is being obnoxious at a presidential speech, town hall meeting, etc., the police can kick them out of that event — interrupting and disrupting a speech or meeting is bad form and impolite. This is completely different than establishing “free speech zones” a distance away from the event that protesters must stand within. Similarly, I have no problem with the Secret Service and police securing the building where the president will be speaking, prohibiting arms within that building, and inspecting people to ensure that they’re not bringing weapons into his immediate proximity. Kicking out disruptive people and prohibiting arms within the immediate proximity of the president are not, in my view, infringements on one’s rights. If the government starts establishing Bush-era “zones”, I’ll be one of the first to be writing to my congressman and voting officials who support such zones out of office. The girlfriend of one of my fellow physics students works on the Lunar Reconnaissance Orbiter project. Taking this is as a challenge, we started calculating the answer. We knew very little details, so we made some assumptions: the hydrazine is in a spherically-symmetric expanding shell, both spacecraft are stationary relative to each other, and gravity is not a factor. In a few minutes we came up with a quick, dirty, back-of-the-envelope calculation that indicated that it would be very unlikely for any hydrazine to contact the optics and, if any did, it would be a very small amount (on the order of a few molecules). My friend relayed our calculations and results to his girlfriend, who was surprised: she didn’t actually expect anyone to bother working stuff out. After a short while, she informed us that our calculations had been passed upstream to NASA for their consideration. Of course, our calculations were almost certainly unrealistic. Even so, they provide a starting point. Yes, physics students actually do this sort of thing in their spare time. Author azriflemanPosted on August 19, 2009 Categories SCIENCE! Indeed, a few comments I’ve read have suggested that one ban firearms within such a perimeter 24 hours before the president even gets there. Such a notion is so absurd that I won’t even bother to address it. What these commenters fail to realize is that the Secret Service already has established perimeters around the president, and he never appears or moves about in such a way that he would be exposed to danger. Had a gunman foolishly attempted to enter the building in which the president was speaking or otherwise posed a legitimate threat, the president would almost certainly be swiftly whisked away while the gunman either gets shot or piled on by the Secret Service. The Secret Service does not mess around. In this particular case, the gentleman with the rifle (as well as the other armed citizens) were all outside and posed no threat to the president. They even called the Phoenix Police ahead of time to let them know what they’d be doing, and the police assigned a few officers there to keep an eye on things and ensure that their rights weren’t violated by other protesters. The Secret Service had no problem with it either. What people calling for more gun-free perimeters around the president also fail to realize is that any potential assassin isn’t going to obey the law; they’re already planning to commit the assassination of a major political figure, I seriously doubt that a legal prohibition against carrying firearms with N meters of the president will have any bearing whatsoever on their plans. The Secret Service realizes this, which is why they absolutely forbid armed people near the president (( When I was stationed at Fort Lewis, then-President Bush came to give a speech. They arranged for Strykers to block off cross streets that intersected the on-base road upon which the president was going to travel. However, the Strykers were forbidden from having any ammunition — US Army troops, on a US Army base, were forbidden from possessing ammunition anywhere near the president or his motorcade. )). Anyone attempting to come near the president must pass through Secret Service checkpoints to ensure they’re not armed, and I’m fairly certain they’re a bit more thorough than the TSA checkpoints at airports. Even if a perfectly gun-free perimeter was created outside the building where the president is speaking, that’s still no guarantee that someone would be safe there: what’s to prevent an assassin from using a bomb (perhaps in the sewers? ), a mortar, or even one of the numerous privately-owned artillery pieces (( Though I doubt an assassin would be interested in filling out all the NFA paperwork needed to own such a piece, particularly if they’d be a prime suspect after the attempt. )) from well out of range of any protective agents? Nothing, of course. What if a hypothetical “gun-free” perimeter overlapped private property? Would residents be forced to disclose their ownership of firearms and surrender them to authorities for the duration of the presidents visit? If so, that’s a serious violation of their rights. If not, wouldn’t this be a major “loophole” in the plan? While there are plenty of spotters, snipers, and counter-snipers observing the area in the immediate proximity to the president, there are plenty of places where a skilled marksman could conceal himself a great distance away (particularly in a city) and, with sufficient training, be able to make an accurate shot. This is why the Secret Service is extremely concerned about moving the president in open areas — they much prefer to move him in a secure manner between buildings to avoid this very threat. In short, it makes absolutely no sense to establish purportedly “gun-free” perimeters beyond what the Secret Service already maintains. Doing so provides no safety benefit to the president (who is already well-protected), does nothing to deter potential assassins, and would only serve to infringe on the rights of private citizens. The Secret Service is exceedingly professional and competent, and I fully trust in their judgment as to what is appropriate when protecting the president and other major public figures. Indeed, they have my full and wholehearted support.